Diabetes is on the rise and costing the Health Service in Northern Ireland more than £1m per day. That’s the stark reality leading academics, healthcare practitioners and pharmaceutical industry figures from both sides of the Atlantic will be discussing at a major health international conference in Londonderry this week. Hosted by the University of Ulster, in association with C-TRIC (Clinical Translational Research and Innovation Centre), the 3rd annual Translational Medicine Conference is on the theme ‘Tackling the Burden of Chronic Illness associated with Diabetes and Mental Health’. The two day event (City Hotel May 5 - 6) will present an ideal networking opportunity for academia, clinicians and commerce to work in partnership to make a difference to the health and mental wellbeing of the community – and relieve the financial burden on the health service. Translational medicine is the term used for the ‘bench-to-bedside’ approach to R&D within international healthcare. It aims to reduce the cost of research into innovative health technologies and medical devices by speeding up the time for the research to be converted into practice. In the United States, health organisations invest an estimated $500 million annually in 60 such centres. Trung Do – who is a member of C-TRIC’s International Advisory Board - has overall responsibility for developing and managing strategic alliances with industry and facilitating the marketing of intellectual property from Partners Hospitals. He attended the two previous Translational Medicine conferences in Derry and said the event provides an excellent platform for local and international companies to build on the connection between Northern Ireland's world class health, business and academic sectors. Ulster’s Office of Innovation at Magee was instrumental in establishing and operating C-TRIC. The 9,000 sq ft complex, in the grounds of the Western Trust’s Altnagelvin Hospital campus, is a one-stop-shop for technology entrepreneurs, academic medical and healthcare researchers, and commercially-funded clinical studies. Dr Whoriskey said “I was very impressed on my visit to C-TRIC and Northern Ireland is lucky to have such a Centre. I have never seen such an excellent convergence of facilities, expertise and partnership under one roof as is present in C-TRIC”. 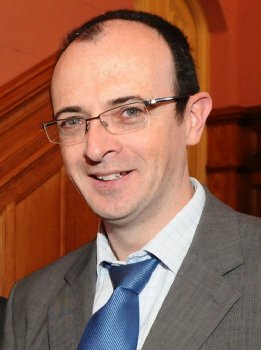 Eddie Friel, Head of Business Liaison and Academic Enterprise at the Office of Innovation, says C-TRIC gives the University and its partners a head start in the fast moving world of healthcare technologies by providing support to small businesses to develop, as well as facilitating international collaborations with academic researchers, clinical practitioners and industry. He confirmed that the conference had attracted US sponsorship for the first time which underlined the pivotal role played by the North West in biomedical research. The conference programme includes papers and presentations about the latest advances in the multi-million dollar industry in the US. Dr Maurice O'Kane, Chief Executive of C-TRIC and Head of Research and Development, Western Health and Social Care Trust said: “There is something really interesting and exciting happening in clinical research in the North West at the moment. The degree to which different organisations have worked together on this important initiative is unique. “This Translational Medicine Conference demonstrates how in partnership we can play a vital role in translating medical advances from the laboratory bench to the patient's bedside. This is an essential step that will ultimately lead to improving the care we offer patients and the public." To coincide with the conference, C-TRIC is organising North West Biotech week, a series of workshops, events and activities to promote the life and health science sector in the North West of Ireland. On May 3, Professor Tony Bjourson, Director of the University of Ulster’s Biomedical Science Research Institute is guest speaker for the May meeting of CafÃ© Scientifique Derry – Londonderry Future Health …….time to get personal! CafÃ© Artisan from 7 – 9 pm. Support for C-TRIC’s Bio-entrepreneur programme will also be flagged up as part of North West Biotech week. The initiative is designed to support entrepreneurs, innovators and start-ups to develop their innovations for better healthcare, whether they are software related, medical devices, diagnostics or therapies by providing tailored support such as the use of a ‘hot desk’ or lab facilities at C-TRIC and mentoring to address a specific issue or problem related to the business idea.